About Aruba: Windmills, lighthouses, twisted Divi Divi trees. 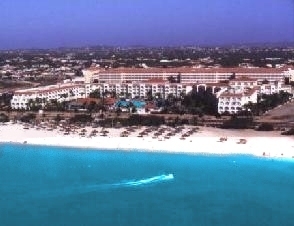 Aruba's unique charm stems from its Dutch influence. Only 15 miles north of Venezuela, Aruba is on of the southernmost islands of the Caribbean. Cooling tradewinds generally keep the temperature a perfect 82°F under beautiful sunny skies year-round. When the sun goes down, a whole different side of Aruba comes to life. Glitzy casinos offer the best of classic American and European gaming. Climate: Almost always dry and breezy. The average rainfall is less than 20 inches a year -- occuriing mainly from October through December. The year-round average daytime temperature is 82°F with very little fluctuation between summer and winter. Documents: U.S. citizens must present a valid passport, original birth certificate with photo ID, or orignal naturalization papers with photo ID. U.S. residents must present a re-entry permit, a valid non-quota immigration visa, and an alien registration card. A driver's license is not a valid proof of citizenship. Citizens from all other countries must present a valid passport. Electricity: 110 volts AC 60 cycles; U.S. appliances are compatible. Taxes and Tipping: The departure tax is US$20. Hotels add 10 percent service charge. 2 percent AHATA tax and 5.6 percent government tax. Tipping is discretionary -- check to see if restaurants have added the 10 to 15 percent service charge. Time: Atlantic Standard Time -- same as Eastern Daylight Time. Languages: Dutch, English, Spanish and Papiamento widely spoken. Marriage Requirements: Tourists cannot legally marry on Aruba, although they can renew vows.